DigiLink :: Internet T3. T3/DS3 45 mbps. Los Angeles T3, Orange County T3. Includes a free router for either service. Installation in 3-6 weeks! Subject to availability. Internet T3 line. 45 Mbps Point to Point T3/DS3. For the ultimate in connectivity we offer Full T3/DS3 connection. We need this to determine what services are available at your location. DigiLink can provide your business with T3 internet access which offers stable, fast and reliable enterprise class internet connectivity. DS3 / T3 line allows for high speed 44.763 Mbps of internet connectivity or point to point bandwidth and is great for companies with expanding bandwidth requirements. At 45 Megabits per second, an Internet T3 line from DigiLink delivers industrial strength bandwidth for the most demanding network applications. DigiLink Internet T3 is ideal solution for integrating voice, video and data applications, providing increased capacity for all of your critical needs. Now offering Native IPv6 support. Up to 8 IPv6 network (/48) address space for no addidtional charge. Our Internet T3 Business Class Service is offered at flat rate - meaning your low payment stays the same regardless of usage. In DigiLink we engineer high performance service directly from your network to the core of our fully switched network, via carrier class fiber optic connections. This results in a completely uncongested connection with one hop onto the internet, without the need to go through clouds or failure prone remote points of presence. 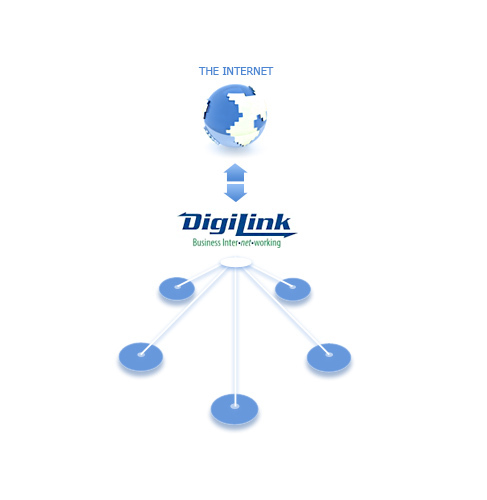 On-site T3 installation and configuration is provided at no-charge for hardware purchased from DigiLink. With pricing starting at $3000 per month for the DigiLink Internet T3 Service we have brought the world of the T3 closer to your business! 45 Mbps Full duplex symmetrical T3 service. BGP option for route redundancy. Any applicable federal, state, and local taxes and/or fees are not included in the above figures. Any such taxes and/or fees will be billed to customer. † Subject to availability, additional charges apply.